"Somewhere I had come up with the notion that one's personal life had nothing to do with fiction, when the truth, as everyone knows, is nearly the direct opposite." Thomas Pynchon maintains such a low profile as to make J. D. Salinger seem like an extrovert. But, unlike Salinger, Pynchon has remained productive in his exile, whilst assiduously dodging the media circus. 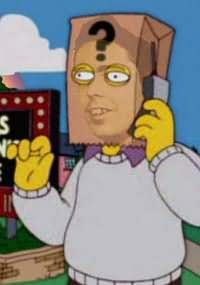 "Thomas Pynchon is the author of V., The Crying of Lot 49, Gravity's Rainbow, Slow Learner, a collection of short stories, and Vineland. He received the National Book Award for Gravity's Rainbow in 1974." Ah, yes, and also the Faulkner award for best first novel. And apparently he refused a third award, the Howell's Medal for Fiction. We know that, and we know this much else of Thomas Ruggles Pynchon, Jr.: he was born on May 8, 1937, in or near Oyster Bay, Long Island, New York. He maintains his mystery. From such reticence one would swear him a proper Yankee: the only times it's fitting to be in the paper is at birth, at marriage and at death. At least we know that Pynchon grew up on Long Island. He attended Oyster Bay High School, and in the "Purple and Gold" high school newspaper he published six short goofy pieces in 1952 and 1953, and is credited a "special writer." Like any good nerd, he worked on the high school yearbook, "The Oysterette," after school and during seventh periods. He was known as "Tom" or "Tommy." In March 1956 he joined the navy, just two months shy of his 19th birthday. He attended Cornell University in the late 50s, where he hung around with the hip, tragic, soon-to-be early-demised author and folksinger Richard Farina. He wrote for the Cornell school literary reader, and was known for being an assiduous devotee to his manuscripts. As author David Hajdu writes in 'Positively Fourth Street', Pynchon and Farina's mutual passions for literature and women fueled their friendship, as did their artistic competitive spirit. Photographed (a rare happenstance!) in a handlebar mustache, Pynchon acted as Richard Farina's best man at his wedding to Mimi. When Farina was killed in a motorcycle accident three years later, Pynchon acted as pallbearer at his funeral. Tom Pynchon's lyrics pepper the pages of his every book. He writes knowledgeably about all styles of music and theory too, and is a passionate fan of rock and roll as well as musical theater standards and, most of all, bebop and jazz. The ultimate device that has endeared Pynchon's work to me in eternity -- his characters are wont to burst into song, just like in musicals! These songs are Pynchon's own foray into absurdist lyricism, and while not terribly "lyrical" (i.e., they don't "sing" smoothly), they are terribly clever and often screamingly funny -- in short, endearing. The fictional characters in most of Pynchon-land have names that sound either too cartoonish or too earnest (viz. Benny Profane, Oedipa Maas, Zoyd and Prairie Wheeler), so we are from the git go delved into an absurdist landscape where nothing or everything is as it seems. incomprehensible. Just see how easy it is to get through a book full of sentence-long paragraphs, by which I mean to say, his paragraphs in 'Gravity's Rainbow' were large chunks of type constructed of SINGLE sentences, whose byzantine syntax made them very hard to read, unless possessed of almost superhuman powers of focus. Pynchon's later works, 'Vineland' and 'Mason & Dixon', though still typically zany, slowed down and communicated on a deeper, more human level. But they also featured zany bursts of lyric, but at least were infinitely easier to read! At one period of his life Pynchon lived in Seattle and worked for Boeing. He also lived variously in New York and in California. To this day nobody is sure where he hangs his hat, exactly - though he is rumored to reside in Manhattan's Upper West Side. He has been generous with his pithy praise for various worthy works and writers (some are friends, of course, as in his introduction to Richard Farina's 'Been Down So Long Looks Like Up to Me'). His last book was dedicated to his wife (a literary agent) and their son: "To Melanie, and to Jackson". 'V' (1963) is main character Benny Profane's search for the Nabokovian ideal, though it is way more convoluted than Nabokov, with a cast of characters longer than your arm (unless you're King Kong). I would also liken this book to 'Last Exit in Brooklyn' on acid -- a slice of life with numerous jacktars, yardbirds and sailors. Pynchon's favorite early topic, entropy, is introduced and fittingly implodes on itself. Entropy concerns the steady degradation or disorganization of a system or society. This concept appealed to me as a callow youth in the '70's, a time when torpor and cynicism also had its appeal. Perhaps this is why early Pynchon has a particular charm for the young and disenfranchised. 1966's 'The Crying of Lot 49' is perhaps Pynchon's most accessible tome. This book plays some more with entropy, but mainly concerns itself with main character Oedipa Maas, a Southern Californian whose adventures lead her into an evil conspiracy with all kinds of cool symbols and a strange underground mail system going by the acronym of W.A.S.T.E. There is of course a sinister corporation and eventually an auction lot numbered 49. The strip poker scene and the mod rock band encounter on the beach are hilarious. 'Gravity's Rainbow' was published in 1973. According to Andrew Dunn in the hyperarts.com Pynchon pages: "Though 'Gravity's Rainbow' is often touted as a formless novel, this is a serious misnomer which misreads lack of plot for lack of narrative coherence ... 'Gravity's Rainbow' is a hierarchy of narratives, rather like a hypertext in which a given line or paragraph at one level in the narrative can suddenly open up into a whole section of underlying expository narrative." 'Slow Learner' (1984) is a pretty cool collection of five early stories originally published individually in various literary magazines. The stories are very much in the classic Pynchon style, packed with dense language, borrowings from physics, wry humor, etc. The book is worth the price for the introduction alone, and if you're a fan, it's a must-have. 'Vineland', published in 1990, was a pleasure. Like 'Crying of Lot 49' it centered around a California protagonist, Zoyd Wheeler (his daughter's name is Prairie), who penetrates a bizarre network of political and environmental conspiracies along with his formerly politically radical friends, who are now aging baby boomers. The lyrics his characters sing in this book are especially cool, as are the letters of Wanda Tinarsky. The plots and characters weren't TOO hard to follow, which works for me. 1997's 'Mason & Dixon' was another LARGE work like 'Gravity's Rainbow', a great Age of Reason historical novel/tour de force about two real-life 18th Century British surveyors, Mason and Dixon, best known for running the boundary that separates Pennsylvania and Maryland, demarcating the "North" from the "South". In Pynchon's imagined depiction one of the two is manic, one is depressive, and they go on exciting adventures around Colonial America, encountering Indians, ripped bodices and all kinds of fun. This is a long work, with many twists and turns, conspiracies and shifts in perspective and reminiscences, with the usual dark humor and dazzling intellect, each page aglint with revelatory diadems. Certainly 'Mason & Dixon' is the most Melvillian of Pynchon's works, as he affects the 19th century writing style, with quaint initial capitalizations and archaic verbiage and all that. If you're looking for a historical novel al ong the lines of Michener, forget it. Pynchon's writing can also be found in magazines. Parts of 'The Crying on Lot 49' first appeared as short stories in Esquire. in June 1966 he wrote a non--fiction piece, 'A Journey into the Mind of Watts' for The New York Times Magazine. "... something trying to find a pathway through to us here in our own corrupted and perilous day, when everybody's heard everything and knows more than they wish they did ... "
"If for no other reason, rock and roll remains one of the last honorable callings, and a working band is a miracle of everyday life." Pynchon rocks! But then, I always sensed that. He supposedly showed up at a Lotion gig and introduced himself, "Hi. I'm Tom Pynchon", or else met them for coffee (nobody is sure). One of the bandmate's girlfriends described him as "very sweet and sort of shy -- and he looks a bit like a rabbit.") Now, THAT'S cool. Pynchon just seems like a nice, unpretentious, brainy guy. He is a workaholic, but perhaps with the years he's learned to balance with periods of pleasure and rest. One friend of mine commented to me that 'Gravity's Rainbow' was "the greatest book written in the 20th century" (and it took this friend six months to read it, s-l-o-w-l-y). Another likened the same book to "one long nervous breakdown". I'd have to agree with the latter. In fact I was undergoing a nervous breakdown at the time I first tried to read it, and so I can't say I got much past the 5th page -- fan of Pynchon though I am! Pynchon is the kind of author who inspires rabid fandom, sort of like a Patti Smith. Surely those who will not propagate their legacy will have it done for them (being somewhat a Luddite, I doubt he'd be the type to erect a website). No Responses to "Thomas Pynchon"